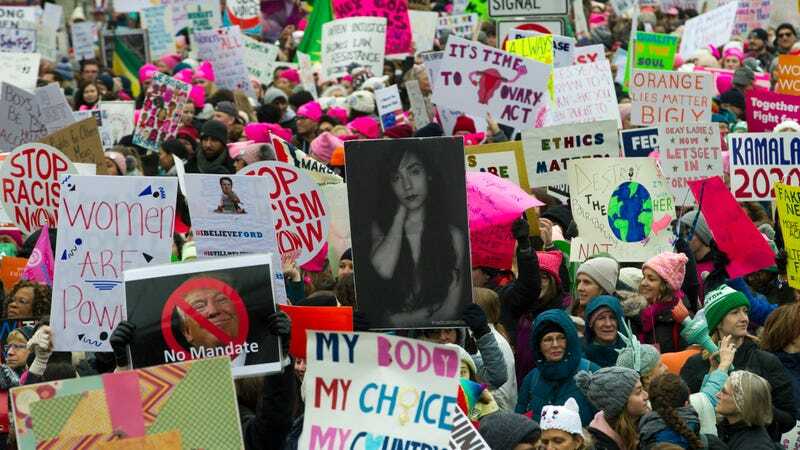 Temperatures in New York City and Washington D.C. were near freezing for the 2019 Women’s March, which is cloaked in controversy this year, but the third annual march still drew an impressive, though smaller, crowd on the East Coast and around the world. Alexandria Ocasio-Cortez braved the cold in New York City, marching alongside protesters there: “All of these women are coming together in solidarity with each other, to support each other, and to make sure that every single voice is amplified, protected and advanced in the United States of America,” she told CNN. Though The New York Times is reporting “much smaller crowds than in years past” it definitely wasn’t tiny. And while 2017's Women’s March was, at least for me, a rage fueled gallop past Trump Tower in the wake of the inauguration, this year, despite the infighting and the fact that many of the people in charge still don’t seem to like women very much, 2019’s march was tentatively hopeful in light of the record number of women newly elected to Congress.